Bullock BIO. A list of dates, names and numbers. | Great Escape. Nick Bullock. Born in Cheadle, Staffordshire a long time ago! Cheadle High School. Leaving April 1982. Gamekeeper. April 1982 – September 1983. Self Employed Farm Labourer and Bricklayers Labourer. Warehouse Manager at Alton Towers. Echoes. Publication of first book. September 2012. Rock Climbing: E8 6b/c & 8a in Britain, Australia, North America, France, Spain. Including: Melody, E8 6b/c, 2nd ascent, Pushing for Rail E8 6b, 1st ascent, The Mudshark E8 6b, 2nd asent, The Zither Player E7 6a, 1st ascent, Requiem for a Vampire E8 6b, 2nd ascent, Box of Blood E76b/c, Bam Bam E7 6b, Destiny E7 6b 2nd ascent – All on Craig Dorys. Strawberries, E7 6b, Tremadog. Stroke of the Fiend, E76b (on sight), Flower of Evil, Wreath of Deadly Nightshade, Demons of Bosch, The Bells the bells!, The Hollow Man, and The Clown all on North Stack Wall, Gogarth and all E76b. Other E7 leads include the first ascent of The Frumious Bandersnatch E7 6c, Rhoscolyn. The second and third ascent of, It Will be Alright in the Night and Authentic Desire, both E7 6b (Cloggy). Conan the Librarian (on-sight). Enchanted Broccoli Garden (on-sight). Heart of Gold direct/Ramaliner combo E7 6b. Free Stonehenge. My Halo E7 6b, Tears of a Clown, (ground-up) Super Duper Calabrese, (on-sight) Burning Bush E7 6b, 39 Slaps E7 6b, Yellow Shark E7 6b, 2nd ascent, Rubble E7 6a, Surgical Lust E7 6b (ground up), Into the Never Never E7 6b, The Trumpet Slappers E7 6b 2nd ascent. . Gimble in the Wabe, E7 6b. The Complete Scream, E7 6b Fair Head. Ring My Bell E7 6b, Gravestones. Other rock climbs of interest: Cities of the Plain E66b All the Pretty Horses E6b and No Country for Old Men E56a/b all new routes on Equestrian Wall. Blood Meridian, E66a new route on Stigmata Buttress Craig Dorys, Birth Trauma E6, Boboc E5, Rust Never Sleeps E6, The Gross Clinic E6, Tonight at Noon E6, Terrahawk E6, Crow E5, Ludwig E6, ME E6, Eraserhead E6, Skinhead Moonstomp E6, Long Run Direct E6, The Jubjub Bird E6 6b, Lord of the Fly’s E6, The Cad E6, Barbarossa E6/7 on-sight, Stiff Sids Cap/Cystitis by Proxy E6, Shittlegruber E6, Piece of Mind E6, Bananas E5. Helmet Boiler E5. Yukan II E6/7 Nescliffe, Bass Drum Heart E6 Nescliffe, second ascent. The Pit and the Pendulum, E5 Nescliffe. Psychic threshold E5 6b, Mr Softy E6 6b. Hells Kitchen Arête E6 6a, Above and Beyond E6 6b, Un Jour, Peut-Etre E6 6b second ascent, The Mask E5 6a, Maiden Voyage E5 6b. Coronary Country E6/7 6b Sharpnose. Darkinbad the Brightdayler E5 6a Pentire Head. A solo of Right Wall E5 6a and Left Wall E2 on Dynas Cromlech in the Llanberis Pass and Pleasure Dome E3 at Pembroke highlight many other solo’s. World party, 7c+, Snake Flake, 7b+, Mr Joshua 7b, all on Typan Wall, Grampians Australia. London Calling 7c+ Arapalies Australia. Les Ailes du Désir Extension 8a, Féerie pour une autre fois Extension 8a, Pyromania 7c+ Gorges du Tarn, France. Bon Viatge 8a, Energia Positiva 7c+, Orient 7c+, Occident 7c. Terradets, Spain. Alcatraz 7c+ La Croix, France. Tequila Sunrise 8a, Moon Safari 7c+, Ramallar 7c+, La boca del a voz 8a, Entre dos caminos 8a. Chulilla, Spain. Alpine Climbing:ED 3, France, Switzerland, Italy, Canada. Including: new Routes on the Grande Pillar de Angle, Lost in the Dark enchainment with The Right Hand Pillar of Frené. ED 2. The first free ascent and the first British ascent of Omega on The Petites Jorasses, ED 3, VIII/8. Tentation on Point Lachenal. 1st ascent with JonBracey. 111/6. 19th December 2006. The House/Anderson, second ascent, North Face of Mount Alberta, Canada. 1938 route Eiger North face. Winter. The Croz Spur ED1, The Colton/MacIntyre ED2 and a solo of the Shroud TD, on the Grande Jorasses North Face. Pressknödel. Cima Ovest North Face. Dolomites. 6a+, 7b+, 7b, 7b, 7a+, 7c, 6c, 7a, 6a+, 6a+, 6a+, 6b. Brandler/Hasse, Cima Grande North Face, Dolomites. Richard Cranium Memorial Route, Droits North Face. Beyond good and Evil ED3 and the Rouse Carrington ED2 on the North Face of the Pelerin. Super Couloir direct VI/6 on the Mont Blanc de Tacul. Dru Couloir VI/5, American Direct and a winter ascent of the classic North Face Route of the Petit Dru. Madness Tres Mince, III/5, solo on the de PrèBarre. Scotch on the Rocks 1V/7, Pinocchio IV/6+, Vol de Nuit IV/8- and Slave to the Rhythm IV/6+, all on the East Face of the Tacul. L’Oeil au beurre noir IV/5+ on the Petites Jorasses. There goes the neighbourhood/Cohen/Collister. Russian Roulette/Gabarrou/Silvy on the NantBlanc face of the Verte. V/5. Overcouloir/Country Couloir Mont Maudet with new variation, V/5. Fantasia per a Ghiacciatore Cirque Maudet V/5+ 6a. Ceccinal/Jager, (winter) with new start. Point Lachenal. Mont Blanc du Tacul. Colton/Brooks and Ginat, 1000m IV/5, North Face of the Droits. Grande West Couloir on the west face of the Plan. M6 WI5+ Free ascent. Peoples Direct ED 2 and The Cassin TD, both on the north face of the Piz Badile. Expedition Climbing: Peru, India, Tibet, Pakistan Alaska and Nepal. Slovak Direct, Denali South Face, Alaska. AK Grade VI WI6 M6+ A2 2700m. 1st British Ascent. Nyainqentangla South East, Tibet. The North Buttress (ED+ 1600m). 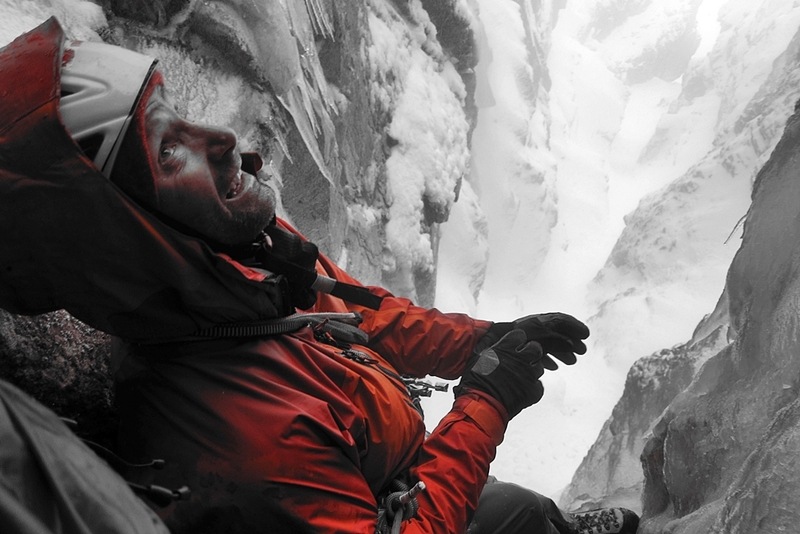 1st ascent with Paul Ramsden which was awarded the Piolets d Ore in 2017. Death or Glory on Hauntsan Sur Cordillera Blanca. TD/ED. 1000m. Plus ten other peaks climbed up to 6300m. India: New Route/Alpine attempt on Meru Central (Sharks Fin) 6500m in the Garhwal, reaching 6100m on the second attempt. Retreated due to bad weather. Changabang: An attempt to climb the second ascent of the Bordman/Tasker on the West Face. Stopped at 6200m due to lack of food, a tooth abscess, deep snow and minus twenty degree temperatures. Kalanka north face new route attempt with Kenton Cool in 2007 reaching a height of 6300m. Pakistan: Savoia Kangri 7263m. New route alpine attempt in the Concordia reaching a hight of 7000m and waiting for 4 days before having to retreat due to bad weather. Nepal: Tengkang Poche 6500m. Northwest face, new route attempt. Two attempts. Failed due to illness and bad weather. Nepal: Tengkang Poche 6500m. Northeast Face new route. Love & Hate TD, V, Solo. Nepal: Tengkang Poche 6500m. Northwest Face, new route, Edge of Darkness. TD+/ED1 IV. 1600m. Peak 41 new route attempt which turned into a solo attempt. Stopped approximately 300m beneath the summit. Chang Himal North Face. Central Pillar. ED. M6. 1800m. Nepal, Kyashar (Peak 43) new route attempt. Spring 2011. Icefall & Mixed: France, Italy, Canada, Switzerland. The Real Big Drip, M9, WI5+. Dawn of the Dead, M8+ WI 6. Rocket Man, 350m, M7+ WI5+. Man Yoga M8. Victoria’s Secret M7++. The Maul, Wedge Peak M7. Exterminator M7 WI6 2nd ascent, Replicant WI6, Fiasco M8- WI 6, Extreme Comfort M7+ WI6, Cascade de la Lyre WI 7, Folly a Droite WI 6, Sea of Vapours M7 WI 6+, T3-Terminator M7, WI 6+, Riptide WI 6/7, Chez Tone, M7+ WI 6, Les Larmes de Merlin, M8+ WI6, French Reality V 5.8 WI 6+, Drama Queen V M7 WI6, Nightmare on Wolfstreet V M7 WI 6+, Teardrop 6, Curtain Call W6, Weeping Pillar 6, Nemesis 6, Whiteman Falls 6, Dame de Lac 6, Cascade du Dard 6, Namenlos IV 6, Rübezahl IV 6, Crack Baby WI6, Alpha Säule WI6, Repentance Super WI6, Patric Directissima 5+, Blue Magic IV 5+, Weeping Wall centre 5+, Hydrophobia 5+ The sorcerer 5, Polar Circus 5. Kitty Hawk 5. Nuit Blanche 6. Tequila Stuntman M6 WI 6. Llinx WI6. Nevermore, Lochnagar. X/10 1st winter ascent. Winter Black Spout. IX/9. Lochnagar. 1st ascent. Ride of the Wild Bullhorn IX/10 1st ascent on-sight, Ben Nevis. Cracking Up IX/9. 1st ascent, Clogwyn Ddu. Snowdonia, North Wales. Guerdon Grooves IX/8. 2nd winter ascent after 28 years. Buachaille Etive Mor. Pic N Mix with the Mindless Finish IX/10 1st ascent. Corrie an Lochain. Satyr IX/10 2nd ascent. Stob Corrie Nan Lochain. Godzilla. IX/8 1st ascent Beinn Bhan. Applecross. Scotland. Cold Revenge. IX/8 1st ascent. Slime Wall, Buachaille Etive Mor. The Wrecking Light. 1st ascent. VIII/7, Cùl Mòr. Ice Bomb/Mind Bomb. VIII/8 1st ascent. Coire Ghranda on Beinn Dearg. Capricorn. VIII/7. 1st ascent. Carn Dearg, Ben Nevis. The Great Corner. VIII/8. Llech Ddu, Wales. 1st winter ascent. Travesty, VIII/8. 1st ascent Clogwyn Ddu. Snowdonia, North Wales. Spaced Out. VII/7 Orion Face, Ben Nevis. Dark angel. VII/8 Church Door Buttress. 1st ascent. Central Wall VII/7 Llech Ddu. Snowdonia. 1st ascent. Falling Angel VII/7 Cwm Idwal, Snowdonia. 1st Ascent. Terminator. VIII/8 Craig Ddu Snowdonia. 2nd ascent. Avenging Angel VII/8 1st ascent Ben Nevis. The Pretender VII/9 1st ascent Ben Nevis. Ruttless VII/8 1st ascent Ben Nevis. The great Flake into The Great Corner VIII/8 1st ascent Ben Nevis. Celtic Connection V/5 1st ascent Stob Corrie nan Lochan. Moonloop IV/5 1st ascent BeindamphTorridon. Nemesis VI/5 1st ascent Ben Nevis Solo. Direct finish to Interstellar Overdrive VI/5 1st ascent Ben Nevis Solo. Snickersnap, Great Gable VIII/9 2nd ascent, 1st on-sight. Defenders of the Faith IX/9, Creag an Socach. Duel/En Guarde IX/9 2nd ascent, Stob Coire nan Lochan. Ravens Edge VII/7, 3rd ascent. Buchelle Etive Mor, Punsters Crack VII/8, 4th ascent, cobbler, Bulgy VII/7 Northern Corries, Central Grooves VII/7 Stob Coire nan Lochan, Han Solo, VIII/8 2nd ascent, Neanderthal VII/7 Lost Valley Buttress. Inclination VII/8, Stob Coire nan Lochan. Babylon 2nd ascent VII/8. Darth Vader VII/8, both Coire na Ciste, Ben Nevis. The Needle VIII/8 and Citadel VII/8 Shelter Stone. Blood Sweat and Frozen Tears, Beinn Eighe. VIII/8. Nocando Crack VII/8 Northern Corries. Unicorn VIII/8, Stob Coire nan Lochan. Arthur VIII/8 Ben Nevis. Daddy Longlegs VIII/9 Northern Corries. Snoopy VII/7 Fuar Tholl.